Not finding out baby's gender? Try these unique and modern unisex names. If you are waiting until your baby is born to find out the gender, it might be a good idea to pick a unisex baby name for your little bundle of joy. 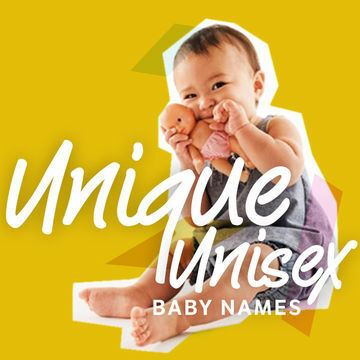 Instead of an ordinary unisex name (such as Dana, Evan, Jamie, Lee or Terry) or trendy baby names (like Aubrey, Connor, Kelsey or Taylor) get a little more creative in your choices. Wait until you find out the gender of your baby before you pick the middle name. If you want to narrow down your choices, pick out a favorite masculine and a favorite feminine middle name that will go well with your unisex first name. Select a unisex first name with a great nickname (or make sure that the initials can be used as a nickname), just in case your child doesn't like the unisex name as he (or she) gets older. Some names that are considered unisex now might not be by the time your baby gets in high school. Name your baby after mom or dad, but not in the traditional way. A little girl named after her father can be really cute, and a baby boy can be named after his mother too. Check out these ideas on how to bestow a mother's name on a baby boy.